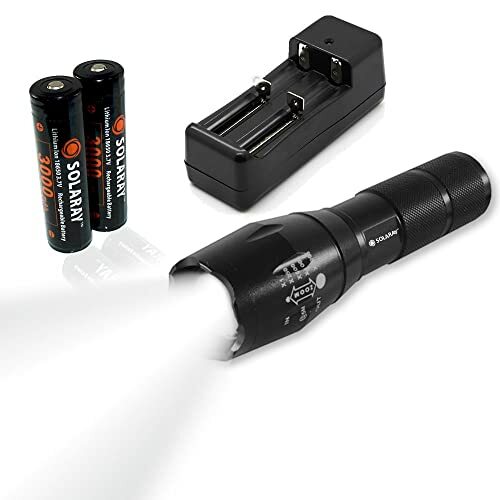 SOLARAY PRO ZX-1 Professional Series Flashlight Kit - Our Best and Brightest LED Tactical Flashlight (rechargeable) max 1200 Lumens, 5 Modes, Zoom Lens with Zoomable Focus, Water Resistant. While it is worthwhile to note that a tactical flashlight not only brightens up your lonely dark nights but also could save precious lives. The mere possession of this torch could improve your chances of living through tragedies and emergencies not just in homes but along the road when your car is in trouble, when you’re stock in a dark place and any other event when artificial light is badly needed. 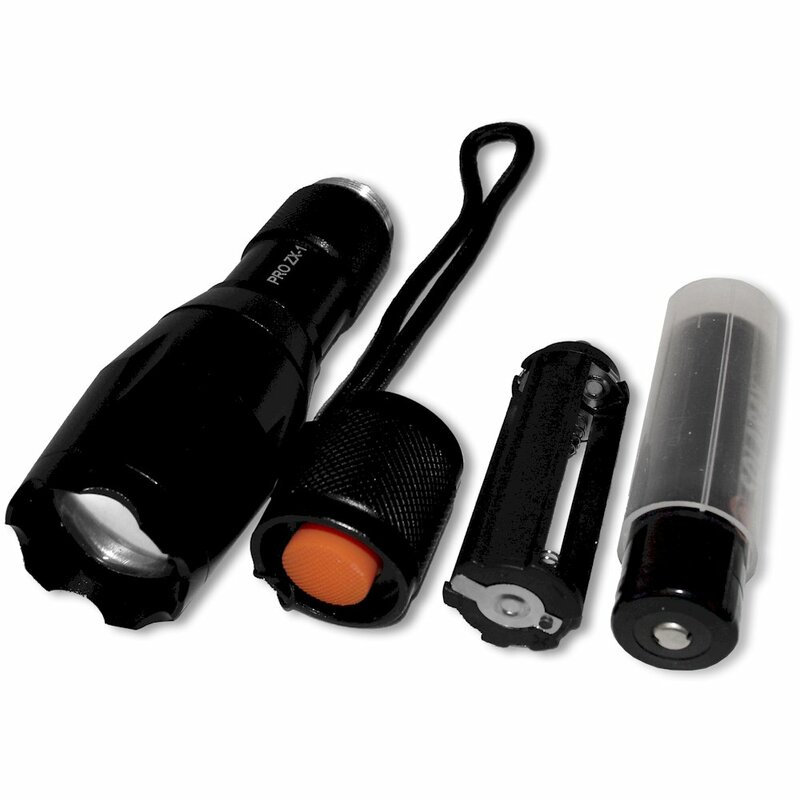 The SOLARAY PRO ZX-1 Professional Series Flashlight Kit is still best for every day use. Solaray says “We will never leave you in the dark”, and they probably saying the truth. Their product, the SOLARAY PRO ZX-1 Professional Series Flashlight Kit is one of their best tactical flashlights in the industry. This type of light used to be made for military and law enforcement personnel. But through the years, designed had been modified to suit everyone. Every home and individual also need to have this type of torch where it could be used not only during emergencies but also for recreations like night fishing, hunting, camping and other outdoor activities during the night. Know more about the Solaray PRO ZX-1, and why you should have one or more of this fantastic product. 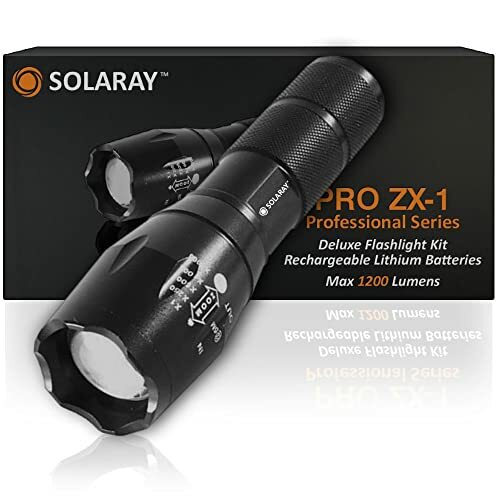 SOLARAY PRO ZX-1 Professional Series Flashlight Kit – Our Best and Brightest LED Tactical Flashlight (rechargeable) max 1200 Lumens, 5 Modes, Zoom Lens with Zoomable Focus, Water Resistant. The ergonomic features of this tactical flashlight, which is basically the Professional Series Flashlight Kit, and which satisfied users have dubbed the “pitch black specialist”, are seemingly endless. Better to know these amazing facts so that you will not be left “crawling in the dark”. The battery compartment, head light housing and the tail cap of this torch is connected by flexible and durable O-Rings making it water resistant. Dust, dirt and other tiny debris are also not capable of penetrating the interior of the tube hereby securing continuous flow of current at any given time, you are sure of its reliability during emergencies. This flashlight would certainly not let you down! The PRO ZX-1 has a powerful and ultra-bright CREE XM-L T6 LED chip which is silicon-carbide base and single die. This advanced technology LED could up to a maximum 1200 Lumens of brightness, more than enough to brighten-up a big room, but can also focus on objects several meters from the user. It is also zooming able by just manipulating the focusing bezel until you achieve the desired brightness in long distance throw. Unlike other brands, this tactile tactical flashlight has 5 powerful and functional modes that you could select depending on the situation you are into during those totally black nights or in any dark environment. The 5 modes are as follows: High-Medium- Low Beam-Brightly Tactical Strobe- SOS (international emergency signal). In just a touch of a button, these 5 modes can be had in sequence. The zoom-lens allows user to manipulate the beam whether in long distance (called “throw”) or “flooded” (dispersed beam). This torch is made primarily from aerospace-grade aluminum, corrosion-free and does not fade away or becomes blurred even after prolonged use. The tough but lightweight aluminum is hardened anodized finish. The lens is of high quality that does not absorb moisture when stored. The tail cap is also made from lightweight aluminum. Rarely have you seen a torch which could adapt to two kinds of power source. Although both are battery-based, the PRO ZX-1 is a two-battery system where you can use 2 different types of batteries alternately, depending on the availability of each. This flashlight could be powered by 2 units of the SOLARAY 118650- 3.7V- 2400mAh Lithium-ion battery (rechargeable) with PCB (protected circuit board), which is included in the package together with charger, while the other one is the alkaline battery size AAA (you need 3 units), which is unfortunately not included in the purchase but could be ordered separately. Both types though, are inexpensive, so you don’t have to worry about the price. This torch is designed with maximum security feature including a strong front mount striking-bezel for self-defense which could be used to strike home intruders or strangers with devilish motives while you are alone outdoors. Barely weighing 0.31 lb. and just 6.25 inches long, this palm-size flashlight is truly handy and portable that you can carry anywhere and anytime. You could put this in your pocket or concealed in handbags and retrieve easily whenever needed, a very convenient and small tool with lots of workings to provide. Since its material is aluminum which do not sagged when temperature is hot outside or contracts under ambient temperature (even if extremely cold like during snowy weather) and its spring is made from the finest metal that does not corrode or lose its tension, tube vibration is almost nil. This torch is also proven shock-proof even when dropped accidentally. Battery Type 18650 Included: There are two 18650 type lithium-ion battery included free of charge in the package once you purchase this torch. Battery Charger Included: A cordless direct plug-in battery charger for the 18650 type is also included without adding extra charge. Deluxe Lanyard: When you ordered, the Solaray PRO ZX-1 flashlight is mounted with a tension-free deluxe lanyard that could be used if the light be stored on walls and other horizontal structure for easy retrieval. Low Power Consumption: The LED bulb only consumes 3.7 volts of power during its use, a very small amount of energy but could enhance the brightest beam. This is a small fraction compared to other high-voltage brands. The lithium-ion battery that this torch has could also be charged more than 500 times throughout its lifetime. Not water resistant in too deep pool of water: This flashlight could resist water in 3 feet deep water for a short period of time, but if it exceeds that depth and at more than two hours it is submerge, water will seep through the segments. So, don’t let this torch sit in your bathtub for long. Tactical flashlight had gone a long way. From a simple attachment for weapons years ago, it is now designed to suit the hands of every individual longing for safe and secure environment during calamities, emergencies or simply for personal use during dark nights. The amazing features of the SOLARAY PRO ZX-1 Professional Series Flashlight Kit is now wholesome like its bright beam to light your room or as search light for missing pets at night and a good companion to brighten up your camping tent or to walk you through the dark alley. Nothing beats the dark side except really the PRO ZX-1.